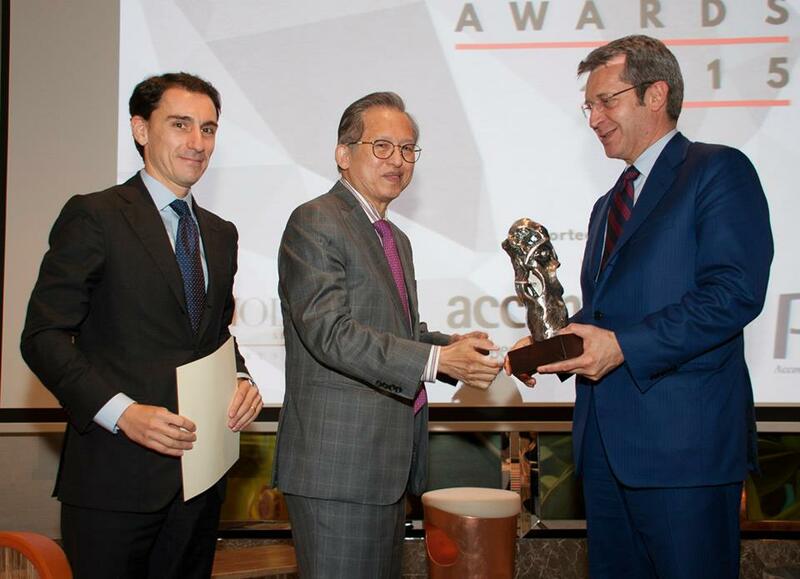 Executive Chairman of Hong Leong Group Mr Kwek Leng Beng was recently awarded “Best Singaporean Investor to Italy” by the Italian Chamber of Commerce in Singapore (ICCS). This annual award is presented to business people who have made impactful investments in Italy and helped to boost bilateral ties between Italy and Singapore. The award was presented to Mr Kwek for the acquisition of the former Boscolo Palace Roma. The hotel has since been rebranded as Grand Hotel Palace. In early 2014, Millennium & Copthorne Hotels (M&C) made its first foray into Italy by acquiring the hotel at €65.5 million. This was M&C’s first hotel in the key gateway city of Rome. At the ICCS Business Awards ceremony, Mr Kwek’s Italian counterpart Mr Massimo Zanetti was awarded “Best Italian Investor to Singapore” for his acquisition of Boncafe, a major food and beverage company. The Undersecretary of State for Foreign Affairs and International Cooperation Senator Benedetto Della Vedova was the guest of honour at the Business Awards Ceremony luncheon. Mr Kwek Leng Beng, Executive Chairman of Hong Leong Group, received the SG50 Outstanding Chinese Pioneers Award from President Tony Tan today. The award, by the Singapore Chinese Chamber of Commerce & Industry (SCCCI), honours the Republic’s outstanding Chinese business pioneers and their exemplary contributions to nation-building. Hong Kong – Burba Hotel Network (BHN), Horwath HTL, and Stiles Capital Events, co-hosts and organizers of the annual Hotel Investment Conference Asia Pacific (HICAP), are pleased to announce that Kwek Leng Beng, Executive Chairman of the Hong Leong Group of Companies in Singapore, will be awarded the HICAP Lifetime Achievement Award. Mr. Kwek will be presented with the award at the 26th annual HICAP being held 14-16 October 2015, at the InterContinental Hong Kong. The HICAP Lifetime Achievement Award honors exceptional individuals who have distinguished themselves through their accomplishments and contributions to expanding, enhancing and advancing the hotel industry in the Asia Pacific region and the world. Mr. Kwek entered the hospitality industry with a single hotel in Singapore in 1971, and has since transformed the Group into a global hospitality player. The Hong Leong Group currently owns/operates more than 36,000 rooms in over 150 hotels across 24 countries. In addition to his role as Executive Chairman at the Hong Leong Group of Companies in Singapore, Mr. Kwek is the Executive Chairman of City Developments Limited, Chairman and Managing Director of Hong Leong Finance Limited, and Chairman of Hong Leong Asia Ltd, City e-Solutions Limited and Millennium & Copthorne Hotels plc. He currently heads a staff of over 40,000 in property investment and development, hotel ownership and management, financial services, and industrial enterprises across Asia Pacific, China, the Middle East, Europe, and North America. Mr. Kwek has received numerous accolades for his contributions to the hotel industry. He was awarded “Outstanding Contributor to Tourism” and “Tourism Entrepreneur of the Year” by Singapore Tourism Board in 1997; crowned “Asia Pacific Hotelier of the Decade” in 2000 by Jones Lang LaSalle Hotels and Arthur Andersen; and named “Best Travel Entrepreneur of the Year” in 2014 at the TTG Travel Awards. Other honors include “Businessman of the Year” in 1996 by Singapore Business Awards and SG50 Outstanding Chinese Business Pioneers Award in 2015. “We are very honored to able to present the Lifetime Achievement Award to Mr. Kwek,” said Jim Burba, president of BHN and co-host of HICAP. “His significant business accomplishments have positively influenced the growth of tourism throughout Asia and indeed the world,” Burba added. Adding to its special nature, the Award is not given out every year and prior recipients of the HICAP Lifetime Achievement Award include: 2011, Marilyn Carlson Nelson, Chairman, Carlson; 2009, The Honorable Sir Michael Kadoorie, Chairman, The Hongkong & Shanghai Hotels, Limited; 2007, Stephen F. Bollenbach, Co-Chairman & Chief Executive Officer, Hilton Hotels Corporation; 2006, Kurt J. Wachtveitl, General Manager, Mandarin Oriental, Bangkok, Thailand; 2005, P.R.S. Oberoi, Chairman & CEO, Oberoi Hotels & Resorts; and 2003, Paul Dubrule, Co-Chairman and Founder, Accor. For additional information on HICAP or the Lifetime Achievement Award, visit the website atwww.HICAPconference.com. Mr Kwek Leng Beng, Executive Chairman of City Developments Limited (CDL) and Hong Leong Group Singapore, was conferred top honours as “Best Travel Entrepreneur of the Year” at the TTG Travel Awards 2014. The award is a new accolade that honours an individual who sets new standards for his organisation’s brand and contributes to areas in the travel industry such as sustainability, training and education. The event was held in November 2014 at Bangkok, Thailand. This achievement is the latest hospitality-related award for Mr Kwek who has received many accolades, including “Tourism Entrepreneur of the Year” and “Outstanding Contributor to Tourism” by Singapore Tourism Board in 1997, and the “Asian Hotelier of the Decade” in 2000 by Jones Lang LaSalle Hotels and Arthur Andersen. Frestec, the consumer appliance arm of Hong Leong Asia, was accorded a Merit Recognition in the Design for Asia category at the Hong Kong Design Centre Awards 2013 for its Libra series of refrigerators. The Design for Asia Awards honours and acknowledges new design projects that have the potential to increase the quality and vibrancy of life in Asia, and create globally sustainable ideas. China Yuchai International Limited was clinched first place in the diesel and liquid natural gas engine categories at the China International Truck Fuel Economy Competition 2014 held in Beijing. The competition was hosted by China Automotive News, the China Automobile Technology and Research Center and China Dingyuan Automobile Testing Center. Click here for a full list of CDL’s awards and achievements. Click here for a full list of Millennium & Copthorne’s awards and achievements. Click here for a full list of HLF’s awards and achievements.